Led by the two dreamy vocals of the Swedish cousins Elsa and Teresa, the quartet from Berlin spans the arc from psychedelic rock with distorted guitars and flat organ riffs to melancholic avant-garde folk with intricate piano passages and hypnotic rhythms. Not only musically, HEKLA dramatically peaks: on the thin line between gloomy abyss and angelic song are also the lyrics created, it is about love, cohesion as well as destruction, obsession and madness. Among other things, the band is inspired by Scandinavian folk psych and 80s synth wave. 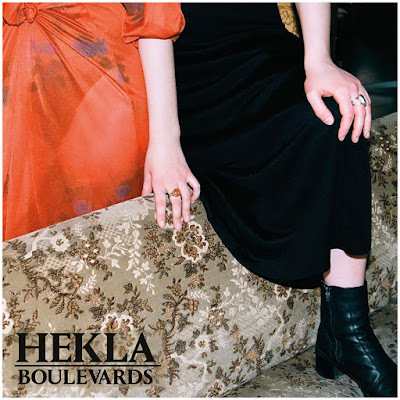 HEKLA have released their self-titled debut album 2017. their new EP Boulevards will be out in June 2018. Inspiration for the first single release “Boulevards” was found in the motives of fraud and love of the film Noir. For fans of The Raveonettes, Alvvays, Verona Falls.